Not sure which forum subsection this is best to post in, so i flipped a coin. Bellingham won the toss and elected to receive. I'm considering a 3-day loop in early august that involves roughly a day in Canada. I'd like to do one of 3 things: either make it to b'ham day one, loop into canada and end up somewhere near oroville on day two and then home on day 3. I could go to b'ham, loop up into canada and back to b'ham, or go to oroville and then loop back to oroville. ideally, though, i'd make the 3-day trip a giant loop and not do any backtracking. I'm open to suggestions. Given my comfort as far as miles per day goes, i could extend days 1 and 3 if that'd help get more must-see terrain under my belt in Canada. Both b'ham and oroville are roughly 320 miles from home. i'm thinking I could stretch that to 400+ or thereabouts, I'm not sure how long the border crossing would take, so i have to take that into account too. I know the forum that shall not be named had an abundance of info on the topic, but the number of different routes and opinions and such were a little overwhelming last i looked. anyone have a favorite road? better yet, anyone have a favorite loop?! keeping in mind, i picked that in 47 seconds on google maps and have done 0 research into the route, roads, destinations, etc. One last thing on the topic: i intend to call my insurance company and verify/purchase coverage for the trip. I also will be getting my enhanced license since I've been told that this will simplify the border crossing and avoid requiring a passport. I intend to utilize hotels, so i won't have to worry about any odd particulars in regards to camping up north. what am i forgetting? In WA, the Green handle at gas stations is Diesel fuel. In BC, the Green handle is an ethanol blended gasoline. Good call on the insurance issue. That's necessary in my book. I can tell you that the drivers on 99 going from Vancouver to Whistler are insane. Be aware of that and expect it. Basically, you've got 2 lanes in each direction and folks want to get up to Whistler as quick as they can for hiking, skiing, etc. I wasn't extremely impressed with the route up to Kamloops but I'm glad I did it once. Not bad, but there are more scenic areas to ride. There is a really nice curvy section that you might want to do a few times if you're in the mood- it's next to Lillooet Lake. Scroll in closely and you'll see that section. Farther north it becomes high desert/farmland almost all the way to Kamloops. 97C someone else will have to describe that section. Looks very doable in 3 days however. thanks for the info. in regards to the map i linked... i was pretty much bullshitting. it's was more for idea/effect than anything. I bunched in the start and end and then dropped a couple waypoints at random. took a look and though "eh, that looks curvy enough to give the hint." please, if you have route/area suggestions i'm all ears. I say do it and let US know how it is! I plan on exploring all those roads in the coming years. FWIW, Trans-Canada 1 is a beautiful highway all the way to Calgary and although you won't get the fast twisties away from traffic, it's worth riding in my book. 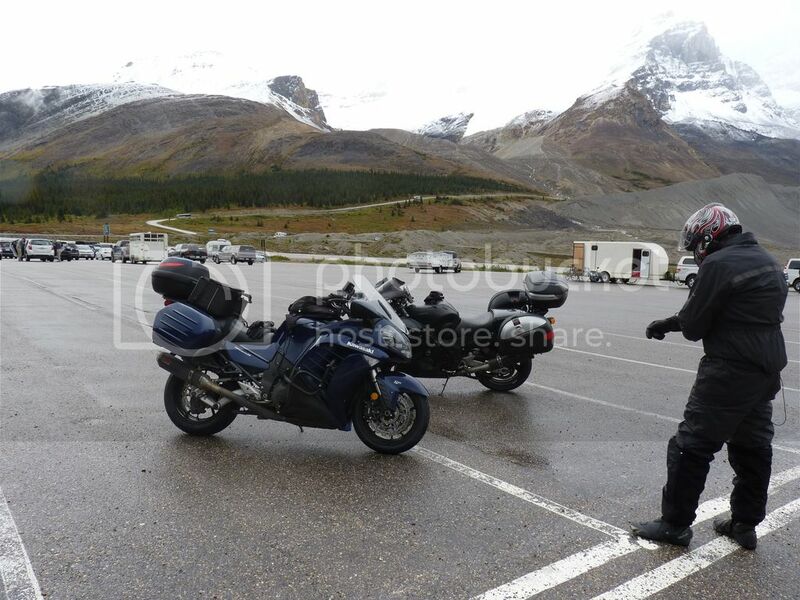 Although not a one day ride, if you ever get the chance to ride the Icefield Parkway between Jasper and Banff, don't pass it up. Although it's only about 170 miles, it took us all day to ride it because we stopped dozens of times to take pictures. And both Jasper and Banff, as well as Lake Louise are very cool towns. how about any of these roads? any yays or nays? probably a bit much for a 1-day ride if i want to stop and take pics, but it's a start? Thoughts on either of these options? They will undoubtedly need tweaking. But it's a step in the right direction? Keep in mind that unless you plan on parking the bike and hiking, all you'll see at Whistler is the massive Olympic complex (think 10-15 story hotels, shopping, restaurants) oh and the mountains behind it all. Really nothing to see unless you're in a car and are willing to go out hiking, biking, skiing, fishing, etc. The granite plutons sticking up just south of Squamish look a lot like Yosemity if you're into geology. Big rock climbing area. Had heard that the Washington ID doesn't meet fed standards and may be discontinued or replaced with something else in future. Probably not this year though. Not up on the cost for this vs. passport. I went into Canada late last year for an 8 day trip, 4 days in Canada and the rest through some USA states home. I have ridden most of those roads you have marked. Personally, I'll never go back due to the lack of good twisty roads. Heavy traffic on Hwy 1. 99 also. We hit Glazier park and some ferries across some of the larger lakes. Whistler, as stated you will not see from the road and traffic that way was heavy and slow. Now jumping over the Canadian border and taking hwy 3 east was my best trip I did years ago. I headed east on 3 pretty far and then headed to Idaho. I met plenty of Canadian riders and they were all headed to the USA because the roads are better here and boring for the most part in Canada. I always head to Eastern Oregon and Northern California. Way better roads, less traffic and better weather. I bet you will do this once and not go back, thats my 2 cents. Cheers. Glazier Park, trailer and tourist traffic was massive on the highway. Nice view though. well this is a bit of a bummer guys. yet, this is the info I came here looking for. I live in the Tri-Cities, so it's a full day's ride to get to Canada and a full day's ride back (and that's slabbing it for the most part). To do all of that and head into Canada only to be sorely disappointed would not be my idea of a fun trip. i may keep looking into options (like only hit highway 3) and throwing them out there looking for input. but it sounds like a long jaunt north may be out. As @flyboymedic stated, Whistler is kind of a pita, but the rest of our trip last year was amazing and it was f-ing pouring at points on day 2 so much that we scrubbed our intended route and ended up taking 1 from Kamloops to Calgary. I'll tell you what, I don't regret it, not even the slightest. I wore a trash bag and had to borrow gloves from Brad, but it was still an amazing day and experience. The scenery from Revelstoke to Banff is incredible. It was an amazing trip and I look forward to more.